According to the rainbow pool, there are currently 104 different colors that can be painted to different pets. As a newbie (or a returning player after a long gap) painting your pet can be a confusing and expensive journey. This article aims to give a bit of a background to different ways to change your Neopet’s color and explore pet specific potions. Paint brushes are perhaps the most straightforward way to change your neopets colour. They range in rarity and price from 40,000 to upwards of 4m neopoints. Some colors or combinations are seen as more valuable or popular than others, which result in the wide ranging cost. Most Paint Brushes are usually handed out through either a random event (Jacko the phantom painter is known to brush past fortunate neopians, leaving a paintbrush behind) or through winning certain games such as the fruit machine or the wheel of excitement. These are incredibly rare events and if you are setting your sights on a particular Paint Brush, I wouldn’t bank on Jacko handing it over to you. So if you can’t buy it from the hidden tower or just stroll up to a passing phantom and request it, how can you get your hands on that longed-for colour? 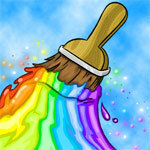 The shop wizard, trading post and auction house are the best ways of finding the right Paint Brush for you. Do your research, check some of the affiliated sites for Paint Brush guides including average price before you start to bid at the auction house or offer on the trading post. Remember – Paint Brushes are an one-use item so think carefully before you use it. Morphing Potions can sometimes be a cheaper way of getting the colour that you want. Thanks to the forgotten shore, Pirate Morphing Potions are now significantly cheaper than a pirate paint brush and for as little as 4,000NP you can get your hands on a Pirate Eyrie Morphing Potion. The downside of a morphing potion in comparison to a Paint Brush is that it not only changes your pet’s colour but it changes their species. This means you need to consider both the colour and species – a Faerie Paint brush is currently trading for around 1.4m but a Faerie Eyrie Morphing Potion can be bought for as little as 21,000NP. The downside is that the Morping Potion will only give you a Faerie Eyrie whereas the Faerie Paint Brush will work on many more species. Ultimately, morphing potions can be a cost-effective way of getting that longed for pet/colour combination for certain colours or pets but there will often be a compromise. Transmogrification Potions are similar to Morphing Potions except they will always change your pet into a mutant. These can be handed out as a Random Event by Dr Sloth or can often be found on the trading post. Some colours can only be obtained through the Laboratory – Robot, Ice, Clay, MSP, Sponge and Garlic are thought to only be gained through zapping. As someone currently saving up for the Secret Laboratory Map I would recommend the benefits of the lab but it is worth noting that unlike Morphing Potions and Paint Brushes, the lab map is totally random. You cannot chose the colour or species of your pet. The lab can change either the species, gender or colour of your pet at random and once changed, you will either need to keep zapping until you get a new colour or species or live with the changes to your pet. Currently full lab map sets are available on the trading post for around 1.75m but buying the set individually can cost around 1.4-1.5m therefore if you have your heart set on a certain colour, it may be cheaper to save for the specific potion or Paint Brush. Magical Plushies are exactly what they sound like – toys which when played with change your pet into an exact replica of the Plushie. Once played with, the magic is lost and it becomes a regular Plushie. Like a Morphing Potion, this can be a cheaper way of getting that pet you desperately want at a cheaper price. This is definitely true for some of the limited edition pets such as Krawks or Draiks. For example, a Krawk Petpet is currently listed on the trading post for 20m but for under 300k you could get a Magical Pirate Krawk Plushie. There is a limited range of Magical Plushies and some are more expensive than others. A lot of the Plushies give more basic colours than morphing potions but give you the chance to own a limited edition pet for a fraction of the cost of buying either an egg, Petpet or waiting for their release date. Magical Chia Pops are pops that can change the colour of your Chia to a fruit or vegetable. For example, a Magical Apple Chia Pop will change your Chia into an Apple Chia. Chia Pops can be handed out in a Random Event or found in the trading post and range from 150k to over 5m for a Magical Pea Chia Pop. Take your time when deciding what colour you want to paint your pet – spending your hard earned neopoints on a colour only to change your mind afterwards is frustrating and a waste of time and effort. Research your pet well, decide on their story and what their colour will do to their personality. A bright, bubbly pet may not suit a Grey Paint Brush and likewise, a big, strong battler probably won’t look so tough as your cute, little Baby Aisha. And remember - you can paint, repaint or morph as many times as you want so if you get bored with their color or character, just go again! Finally – when you’ve decided on a colour and achieved it, enjoy it! Achieving a goal or dream on Neopets is an important part of many players game and when you get that dream pet, make sure you sit back and take pride in your achievement! Happy Painting! I headed over to the very place you show off your fanciest fonts and most amazing avies: The Avatar Chat. I asked the players there what kinds of avatars they would like to see in the (hopefully not too distant) future. I`ve split the suggestions into different categories corresponding to which area of the site they`re related to. Who doesn't love some cool game in this cool winter? Bad, Tomos. It's back to Kleptomaniacs Anonymous with you. It's almost time for holiday cheer, shopping, cards, parties, and sweets. Holiday food is something that can't be overlooked. It is in a class on its own. When it comes to food, Christmas is one of the holidays that can't be beat. From the month-watering turkey and vegetables to the scrumptious sweets and drinks, the food choices are almost infinite.